This villa was recently sold and the new owners have made numerous improvements to the property. The kitchen has been refurbished and the living room furniture has been replaced. They have also added new safety railings to the stairs and pool. Other improvements are ongoing but will not interfere with your stay. You will be taken care of from beginning to end and if there is anything you need before or during your stay just let me know and it will be done. Absolutely loved our stay. Alex was very helpful scheduling a successful fishing trip as well as a fantastic meal at Casa Capuchin. Not too impressed with the fourth bedroom located downstairs, but the other amenities made up for it. Highly recommend. Unique house, open air living room a treat! Lots of space, mulileveled, open air with pool, views, breezes and privacy. Our family of seven loved it. We stayed at Casa Capuchin for one week. The house is beautiful and well maintained, and it is located on a quiet road within walking distance of some good restaurants and shopping. The beaches are a 5 minute drive from the house. We saw Capuchin monkeys daily, and also saw Howler monkeys and a sloth! Alexander arranged multiple excursions for us, all of which were fantastic. 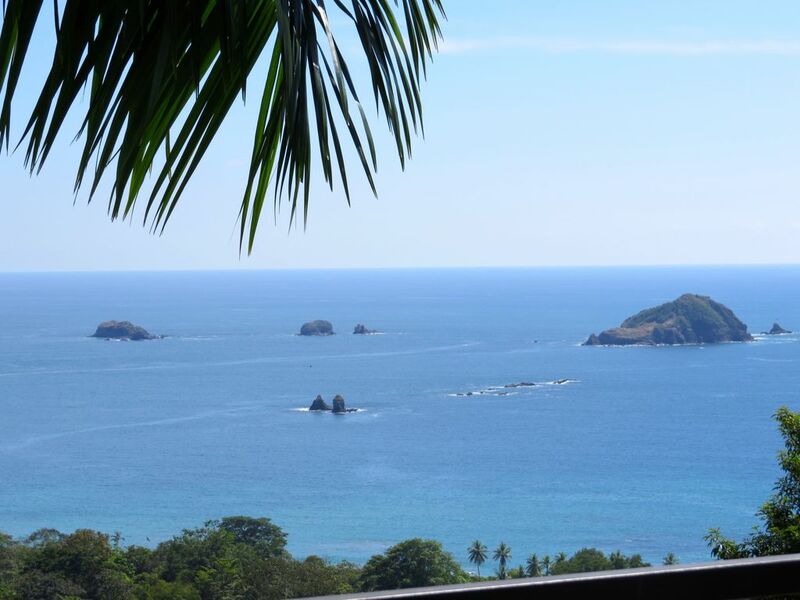 We highly recommend Casa Capuchin! First time VBROers so we were excited based on the pictures but also still wondering if we were going to be disappointed. The house matches the pictures perfectly so you will not be surprised in a bad way. Alexander was awesome. He helped us navigate to the house as we were first time visitors to Costa Rica. Then he helped us with activities and they were all excellent. We did use the chef service even though the restaurants in the area were excellent. They cooked a wonderful meal and even cleaned up. The house keeping was also excellent. The Wifi was fast and reliable. I can't comment on the TV because we didn't even turn the TV on. There is an ipad by the TV with all the information you need for your stay which again was awesome. We were visited by 3 types on Monkeys everyday along with the beautiful birds you would expect in a tropical rain forest. The views from the top two bedrooms are the best. But also the lowest bedroom offers a lot of privacy and you feel like you are in the jungle. When you go on vacation you do not want to be hassled by little things and the setup of the home and Alexander's excellent service took care of all of it and we just enjoyed our trip. We are officially spoiled and we want to avoid hotels from now on when we go on vacation. This is an absolute beautiful property. Parking would be a little tight in front of the house if you had more than two vehicles. Alex is super friendly and helpful. He's your go to guy from ordering you a pizza to having booze delivered to your door. We had a small wedding ceremony on the back porch and it worked out splendidly. What an awesome view! Just got back from spending a week at Casa Capuchin. Amazing house couldn't ask for better. Beautifully decorated and had everything we needed and then some The view was breathtaking. Alex got us everything we needed, made all of our arrangements for us. The house was always amazing clean. Came home one day to find 8 pairs of muddy sneakers all clean and drying. Thought we would throw some away they were so bad. We had Alex arrange for someone to cook us dinner the first night after traveling all day. It was one of the best meals we had. Highly recommend it. Do the off road dune buggies. So much fun. All I can say is go you'll have fun. Lush tropical paradise with beautiful views at every turn ...unique wildlife observation ...monkeys, sloths, birds...fantastic surf for begginers and experienced...paradise for body surfers, sunbathers and sand castle builders. Restaurants with exquisite dishes prepared with fresh food from the area...friendly, helpful people wherever you go.